A musical pioneer who was among America’s first wave of jazz and blues recording artists in the 1920s, Lucille Hegamin was born Lucille Nelson in Macon, Georgia, on November 29, 1894. She grew up singing in church and at the age of fifteen joined a tent-show touring company performing standards of the day. 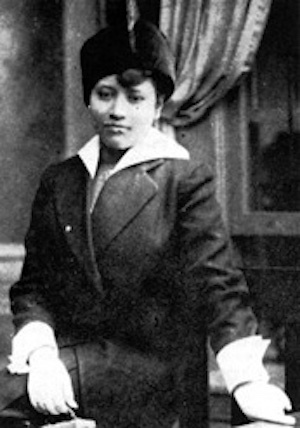 She traveled around the country until 1914 when she settled in Chicago, Illinois. She made a living in nightclubs as a pop, blues, and jazz singer, working with a number of popular musicians of the period including pianists Tony Jackson and Jelly Roll Morton. She occasionally used the alias Fanny Baker and was known to many on the club circuit as “The Georgia Peach.” While in Chicago she met and married pianist Bill Hegamin. The couple eventually settled in New York City, New York in 1919. In New York, Hegamin continued her career as a club performer with her husband leading her backup band, the Blue Flame Syncopators. The group toured from time to time through New York, Pennsylvania, and Ohio with Hegamin sometimes billed as “The Chicago Cyclone.” Hegamin caught the attention of Arto Records, a small, independent record label with a studio in Manhattan. In November of 1920, she became one of the first significant African American female artists to make a blues record. Backed by the Blue Flame Syncopators, she recorded “The Jazz Me Blues”and “Everybody’s Blues” for Arto, both of which sold well. She then recorded “Arkansas Blues,” a bonafide hit that made her reputation as one of the leading female jazz and blues performers of the era. She eventually left Arto and moved to the Cameo Record Company, another independent, Manhattan-based label that specialized in jazz and blues dance music. Billed as the “Cameo Girl,” Hegamin recorded dozens of sides for the label during the 1920s, including “He May Be Your Man,” “But He Comes to See Me Sometimes,” her signature song and one of the most popular blues numbers of the period. In 1922 she joined the touring cast of “Shuffle Along,” the successful African American musical review written by Noble Sissle and Hubie Blake. After Hegamin’s marriage ended in 1923, she worked with a number of other prominent artists, arrangers, and bandleader, appearing on radio and touring with several musical theater troupes through the end of the decade. As the blues craze of the 1920s faded and the Great Depression set in, Hegamin’s career declined. In 1932 she made two recordings for Okeh Record and the next year began appearing regularly at the Paradise Café in Atlantic City, New Jersey. In 1934 she retired from performing and became a nurse. During the early 1960s, she made a brief return to the music industry and eventually made her final public performance in 1964 at the Celebrity Club in New York. She died in New York on March 1, 1970. Linda Dahl, Stormy Weather: The Music and Lives of a Century of Jazzwomen (New York: Pantheon Books, 1984); Ken Kunstadt, “The Lucille Hegamin Story,” Record Research, no. 39 (November, 1961), No. 40 (January 1962), no. 41 (February 1962), and No. 42 (May 1962); Scott Yanow, Jazz on Record: The First Sixty Years (San Francisco: Backbeat Books, 2003). (January 1962), no. 41 (February 1962), and No. 42 (May 1962); Scott Yanow, Jazz on Record: The First Sixty Years (San Francisco: Backbeat Books, 2003).